James Curley the son of Irish immigrants from County Galway, was born in Boston on 20th November, 1863. He worked as a salesman for Logan, Johnson & Co before becoming involved in the real-estate and insurance business. Curley was active in the Democratic Party and was a member of the State legislature (1902-03) and the Boston City Council (1910-11) before being elected to Congress on 4th March, 1911. Curley resigned in 1914 to challange another Irish-American, John Francis Fitzgerald, for the post of post of mayor of Boston. He was mayor until 1918 and again in 1922-1926 and 1930-1934. Although he was twice sent to prison and was generally believed to be a corrupt politician, Curley was popular with the large Irish population in Boston. However, his opponents described him as the "Irish Mussolini". Curley was also Governor of Massachusetts (1935-37) and a member of Congress (1943-47). Curley became mayor of Boston again in 1945 but was found guilty of corruption while in office and served five months in prison before being pardoned by President Harry Truman. He was an unsuccessful in his attempts to be the Democratic Party candidate for mayor in 1951 and 1955, and with his political career finished, wrote his autobiography, I'd Do It Again (1957). James Curley died on 12th November, 1958. 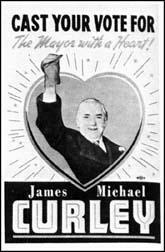 A worst-list without Boston's "lovable scoundrel" Mayor J. Michael Curley (1914-17, 1922-25, 1930-33, 1946-49), also known as the "last-hurrah mayor," would be like corned beef without cabbage on St. Patrick's Day. Twice jailed, the unstoppable Curley made more political comebacks than a dying opera diva. A masterful and cynical exploiter of his own people's poverty, he inflamed the ethnocultural conflict of his city and turned Boston city politics into a three-ring circus for half a century. Although, as his biographer Jack Beatty shows, Curley grossly enriched himself at public expense and lived far beyond the means of an honest public servant, financial self-aggrandizement was not really what Curley was about. Curley lived for politics and loved coming in first, no matter which office or honor he ran for. He undoubtedly would have resented coming in fourth-worst in a ten-person field, had he lived to see this expert survey.